I can't think of another comic book movie character to have more "first looks" than the Vision. We've had blurred posters, concept art, promotional art, teasers in behind the scenes footage, and the briefest of looks in the trailers. But this might be the first time we've seen the full character, in the android-flesh. Entertainment Weekly has released images of its covers for this week's issue, covering the magazine's summer movie preview as well as highlighting its coverage of Age of Ultron. And among the group of Avengers assembled (through heroism and the magic of photoshop) to take on Ultron is our best look yet at what Paul Bettany will look like as the Vision. Don't forget to click to embiggen! Like I said, it's not really the first time we've seen the design, but it's still interesting to see the design translated from art into an actual costume worn by a person. Look, it's purple Paul Bettany and everything! He looks pretty damn spectacular. What do you think? 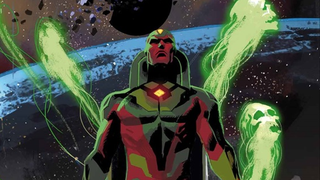 After all these little teases, are you happy with how the Vision will look on the big screen?